Capital of the Dodecanese. The perfect island for those who want to relax but also for those who seek a more adventurous holiday. It has great touristic facilities and numerous cultural and archaeological sites. Overall, a perfect holiday destination. A good way to move around on this beautiful island is by renting a cheap car. Rhodes is the biggest of all the Dodecanese Islands. The island is blessed with more than 300 days of Greek sunshine every year and as soon as the summers start, the beach fills up with people from all over the world. A lively nightlife, great shopping opportunities, versatile culture and a breath taking coastline; Rhodes offers it all for a great holiday. Make the most of it all by opting for car rental to get around. Rhodes is a very lush green island. The capital of Rhodes Town is very captivating. The Old Town area is a particular attraction because of its medieval fortifications and Rhodes Town is also the centre of the tourism industry of the island. Lindos is the best resort on the whole island along with the Old Town area in Rhodes Town. People can travel to Lindos by bus as well as by water. 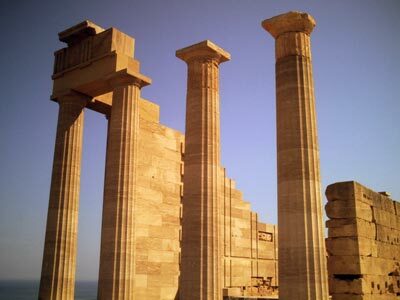 Lindos is almost 2 hours away from Rhodes Town but Rhodes car hire makes it so much easier. A lot of historical attractions are located at this resort such as the bright white houses with mosaic courtyards which were built in the 17th century and the 15th-century Church of Agios Ioannis. Lindos dates back as far as 2000 B.C and it was once an ancient city. More than 200,000 tourists visit the Aquarium every year. It is located in Rhodes Town next to the seafront. There are all kinds of fish, crabs, molluscs, and sea turtles. There are also whales and Mediterranean monk seals. This is a popular day out for all the family. Lardos is also a very popular resort, which located just below Lindos. Nearby attractions include Pefki, Glystra Beach and the Monastery of our Lady. The central square of Lardos and Lindos are the places where the nightlife can be found. The Andrenalin glass bottom boat is a very famous tourist attraction of Rhodes. A lot of tourists enjoy cruising on this boat around the coastline of Rhodes. The cruise time is almost three hours and the boat travels between Kiotari and Lindos. Car hire is a great choice for getting to either of these places. With such crystal clear waters many of the tourists opt for scuba diving. There are three scuba diving schools in the Mandraki harbour in Rhodes Town. A lot of schools offer the chance of trying your hand at scuba diving at a reasonable cost. The only official site for scuba diving is Kalithea Thermi but tourists can be seen snorkelling everywhere. No matter what you choose to spend your holidays doing, Rhodes car rental will help you make the most of every moment. At Rhodes Airport are several ways to get to and from the airport. Check the corresponding time table for the departure times of the buses. Another option is to go by taxi which will be more expensive but more direct. When traveling we advise to carry some Euros to avoid any unwanted surprises. At Rhodes Airport there are Money Exchange offices in order to change your local currency. The local time code for Rhodes is CEST. As not all car rental companies are open 24 hours at Rhodes, you will still be able to collect your car before or after opening hours. Click on the car rental company logo for the opening hours and check the detailed rental terms for the extra fee. When traveling to Rhodes make sure to check the local weather conditions in order to avoid any unpleasant surprises. Rhodes has approximately 50,363 inhabitants. The best way to discover Rhodes Airport is by renting a car. Renting a car is easy and affordable way of transportation. With your rent a car you can explore the beautiful surroundings of Rhodes Airport. Rentalcargroup.com works with numerous rent a car companies in Rhodes Airport. Last month, the average car rental length at Rhodes Airport was 6 days. The average rental car length at Rhodes Airport is 6 days. The most booked rental car type currently at Rhodes Airport is ECONOMY cars. Last year, the most booked rental car type at Rhodes Airport were ECONOMY cars. How much does it cost to rent a car at Rhodes Airport? Last month, the average car rental price was 121 USD. Last year, how much did it cost to rent a car at Rhodes Airport? Last year, the average car rental price was 211 USD. What is the current average daily price to rent a at Rhodes Airport? Last month, the average rental price was 21 USD per day. How much did it cost to rent a car at Rhodes Airport over the past 12 months? Last Year, the average rental price was 33 USD per day. The car rental companies available at Rhodes Airport are: Alamo, National, Enterprise, Green Motion. See below last 5 customer reviews. Our customers rated Rhodes Car Rental with an average of 0.00 based on 0 ratings.